Whey Hydrolysate is a supplement being an excellent source of all essential amino acids for our body. This is the highest quality hydrolyzed whey protein Optipep. 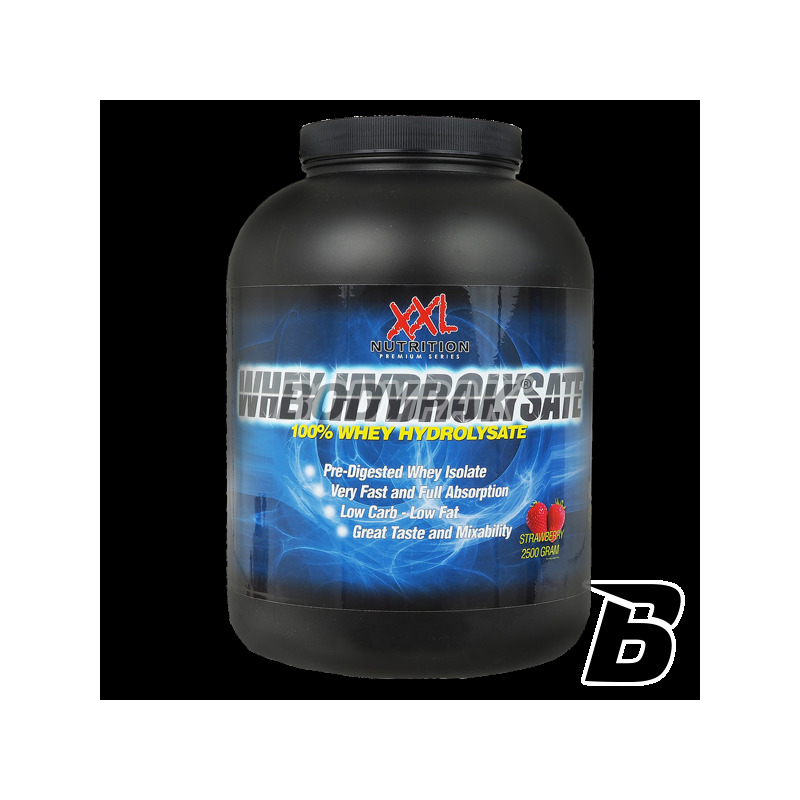 XXL Whey Hydrolysate - is a supplement which is an excellent source of all essential amino acids for our body. 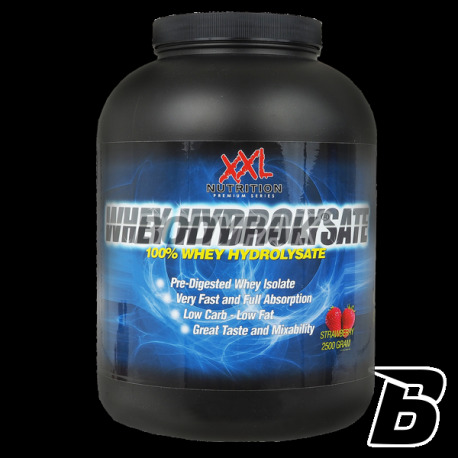 This is the highest quality hydrolyzed whey protein Optipep. L-Lysine - must be supplied from the diet because the body is unable to synthesize it. Exhibits antioxidant (destroys free radicals) and thus helps fight diseases and helps raise the level of Growth Hormone, present in the construction of collagen, absorbs calcium and improves mental concentration. L-Threonine - play an important role in the synthesis of collagen and thereby improve the condition of our joints, ligaments and tendons. It is also present in the production of antibodies and can reduce process otłuszczania liver. L-Fenyloalania - is converted to tyrosine, which is a precursor m.in . : Dopamine, Adrenaline and noradrenaline (stimulate the central nervous system, relieve depression, improve memory and concentration). L-Arginine - involved in the formation of nitric oxide and thus has the ability to expand the blood vessels, allowing for better blood circulation in the muscles and soft tissues. Indirectly involved in the synthesis of cGMP which, together with ATP is involved in muscle contraction and has an anabolic effect. It affects the secretion of growth hormone, supports the process of liver regeneration is an important precursor for creatine. Aspartic acid - involved in the metabolism of carbohydrates, magnesium and potassium are transported from the cells helps in removing ammonia from the body. Glutamic acid - part of the neurons involved in the synthesis of acetylcholine and adrenaline, reduces nervous exhaustion, improves memory and concentration. Is converted to glutamine. L-Glycine - participates in the formation of red blood cells and thus affect the transport of oxygen in the blood plays an important role in the synthesis of Glucose and Creatine. It combines with many toxic compounds (including by-product of processes energogennych accompanying physical exertion), deactivate them and helps in removing them from the body. L-Histidine - with Beta-Alanine participate in synthesis of Carnosine thus preventing nadbudowywaniu lactic acid, allowing the train longer and heavier. L-Serine - involved in the synthesis of many in the brain, the compounds (m.in . : acetylcholine), thereby affects the behavior of its correct functioning and structure. L-Tyrosine - is a precursor to adrenaline, dopamine and norepinephrine (necessary for proper operation of the nervous system). Składniki: hydrolizat białek serwatki, lecytyna sojowa, aromat bananowy, sukraloza (substancja słodząca).